In this guide we will explore why our brains need plenty of rest during traumatic brain injury (TBI) recovery, what happens during sleep deprivation, how exactly a brain injury affects sleep and tips for getting more restful slumber. Tips for improving sleep quality when recovering from a brain injury. We demand a lot from our brains during the day, so re-charging at night is essential to meet these requests. Taking in new information, processing emotions and getting our bodies to perform actions; our hard-working brains have a pretty long shift during the day. Rest at night is crucial to allow repairment and removal of toxins. Our nightly slumber is used for rejuvenation, so our mind is ready for the day ahead. It is also an essential time for storing memories. Big or small, we have plenty of new experiences each day, some of which get stored in our long-term memory. They are first processed before transferring from our short-term memory to our long-term memory. We all are familiar with that sluggish feeling after you get a poor night’s rest, but do you know why our brains react this way to an insufficient snooze? Your brain has failed to properly process and store the memories from the previous day, so it’s understandable as to why it struggles staying focused after a poor night’s rest. Your brain finds it much harder to concentrate on a task, make decisions and pay attention to something or someone. It’s common to feel grumpy, frustrated, upset or sad when experiencing deprivation. But, why? Well, our brains find it difficult to control our emotions and lose their capacity for balance and control. This leads to all sorts of unusual emotions you may not normally experience, and it can also make you more sensitive to stress than usual. Staying awake as little as 19 hours can affect your speed and accuracy score on a judgement test of motor reaction time as much as if you were legally drunk. Sleep deprivation can massively increase your reaction time, which can be dangerous for tasks such as driving, but could also be detrimental at work, school or other responsibilities you have. As your brain hasn’t even processed the new memories and skills from the day before, it’s certainly not in any position to start learning even more new things. Whether this is learning a physical skill or an intellectual skill that requires your memory, there is a much higher chance of it being soon forgotten. Amyloid-β (amyloid beta) is a protein founded by Alois Alzheimer in 1906. Scientific research shows that an accumulation of this protein in the brain can cause Alzheimer’s disease. Sleep deprivation can increase amyloid-β, University Health News tells us. Although new research is developing every day, there is still plenty to suggest that sleep is essential for any brain injury recovery. It makes sense as our brains suffer so much when deprived of rest, but can it really speed up recovery? 30 patients who sustained a TBI in an age range 0f 17 – 58 were monitored during a 45 day hospital stay. Researchers monitored their sleep-wake cycle and results showed that sleep quality and brain function improved simultaneously. Patients who still had low levels of consciousness and cognitive function followed a similar pattern of sleeping for a few minutes and waking for a few minutes. As well as an improved sleep-wake cycle in patients with improved cognitive function, researches also found that slumber quality improved as well. Many other professionals have also declared the importance of sleep for a TBI recovery, with some even stating that poor sleep could have a detrimental effect on recovery. Your brain works hard to repair itself after it has sustained an injury, so allowing it to fully repair and rejuvenate every night is essential. Issues with sleep are one of the most common symptoms after sustaining a traumatic brain injury (TBI), with 30 – 70% of people with brain injuries being affected. 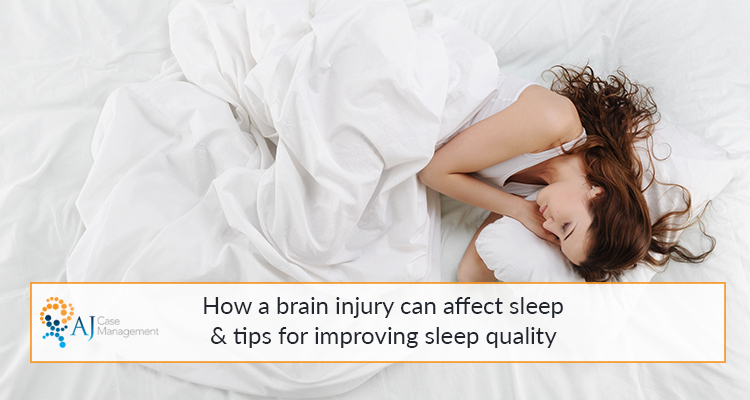 There are various ways the brain can affect sleep after sustaining an injury. As brain injuries are so diverse and each one is unique, there is no blanket reason that covers all areas. However, from scientific research there are processes that have been identified as detrimental to our slumber after a TBI. Firstly, if the part of the brain that controls the sleep-wake cycle is injured, this will lead to a disrupted pattern. We rely on neurotransmitters to regulate tiredness and wakefulness and they act as signals to our body to say whether it’s time for bed or waking up. When injured, the brain may not produce the correct neurotransmitters at the right time. This can result in difficulty falling asleep or disturbances throughout the night. Insomnia – having regular problems falling/ staying asleep. Fatigue and daytime tiredness – irritability, slow reflexes, struggling to focus on simple tasks. Narcolepsy – a disorder that causes the person to fall asleep suddenly at inappropriate times. Sleep apnoea – caused by pauses or phases of shallow breathing during the night which can limit the oxygen supply to the brain. Periodic limb movement disorder – repetitive or excessive cramping or twitching of the limbs. Delayed sleep phase syndrome – a disorder that delays a person’s sleep by 2 hours or more, which causes them great difficulty in waking up the next morning. Stick to a regular routine – adhere to a regular routine when going to bed and waking up in the morning. Even on the weekend, try not to alter this by any more than 15 minutes. Once you get into a consistent routine, your body will begin to automatically become ready for bed and wake up at your regular times. Cut back on caffeine and nicotine – these substances are stimulants which arouse brain activity, making it much harder for you to switch off and fall into a restful slumber. With the effects of caffeine lingering for several hours or even a few days for those who are particularly sensitive, it is recommended to avoid all together for the best night’s rest. Create a relaxing environment – if possible, make sure your bedroom is in complete darkness and at around 15 – 19°C. This is the optimal environment for night time as even the slightest bit of light can have a detrimental effect, and a cooler temperature is better for a more restful slumber. Get plenty of sunshine during the day – not only is it important to create complete darkness at night, but it is also important to get sunlight during the day. This gets your brain and body into a better sleep wake cycle and gives you your daily dose of Vitamin D.
Keep stress and work out of your bedroom – once you start working in your bedroom, your brain may start to associate this stress with your bedroom environment. Make sure to complete strenuous or stressful activities outside of your bedroom to keep it as a peaceful environment. Stop using electronic devices an hour before bed – the blue light emitted from most electronic devices stimulates our brains and has the opposite of the relaxing effect we are looking for at night time. Try refrain from using them at least an hour before bed to give your brain chance to switch off. If you’d like more tips and advice, take a look at this guide to improving deep sleep naturally. At AJCM we offer support to those recovering from a brain injury and we help people find the best rehabilitation plan for them. No one should face recovery on their own, which is why we’re there every step of the way. We created the AJCM blog to offer advice, our expertise, updates in case management and start discussions around serious injuries and rehabilitation. If you have a question or comment to add, please feel free to leave it below.